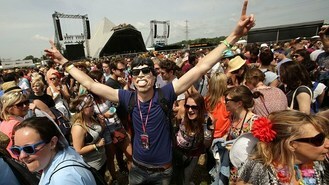 Hundreds of festivalgoers proved they had the moves like Jagger by taking part in a Jumping Jack Flashmob at Glastonbury. The Jagger Off, arranged by two Rolling Stones fans to celebrate the band's first appearance at the festival, saw crowds of people mimic Sir Mick Jagger's trademark dance moves. It was held near the Pyramid Stage, where the band will perform their headline set on Saturday night, under the watchful eye of a giant metal phoenix that is perching on top of the structure this year. A sound system played classic Stones songs including Brown Sugar and Start It Up to about 400 fans. Organiser James Duke-Evans, 33, from south London, said: "It's gone fantastically well. When it got dreamed up late at night we thought it would be funny if 100 people turned up, but 3,500 joined the Facebook group in the end. "People like to get involved in something that's not scripted and programmed. I've been told some people were looking forward to this more than the festival itself. "And quite frankly - do you really want to live in a world where things like this don't happen?". Sir Mick is expected to be on the festival site over the weekend, and is staying nearby with his family. There is a chance he might even stumble upon the second "Jagger Off", at the silent disco held in the early hours of Saturday morning. Many of those performing the moves, which including the "finger waggle" and "squeezing through a narrow doorway", wore Jagger masks as a tribute to their musical hero. Richard and Adam have signed a record deal with Sony Music. Justin Bieber is being sued by a paparazzo who claims the singer kicked and punched him last year at a Southern California shopping centre. Liam Gallagher has apparently changed his mind about performing at Glastonbury. Rolling Stones star Keith Richards said the band was "destined" to make an appearance at Glastonbury, despite turning down a slot for many years, and declared: "It had to be done. One Direction have given fans a taste of their forthcoming movie by releasing a three-minute-plus trailer. Stage outfits worn by Michael Jackson, Madonna and Freddie Mercury are to go on tour. Michael Buble has said his new single Close Your Eyes is a salute to women.